Last week was a bad one for Herald Sun cartoonist Mark Knight, as you may have heard. Not that his cartoons were off the mark, which can be said of very few of them. Rather, it was a fine cartoon of tennis harridan Serena Williams that brought out the social media screamers and all-media maulers in their howling legions. As is the Left’s custom, he was abused and threatened by anonymous cowards — so much so that even his wife and children became the targets of digital stalkers. The Guardian joined the pile-on — how could it resist? — by adding its customary shallow gloss to encourage this mugging. Whereas the Twitter mob’s reaction went no deeper than ‘He works for Murdoch and drew a black woman. Lynch him!’, The Guardian set out to justify such umbrage. Didn’t Mark know that his imagery offended African-Americans? This was rich indeed — and inconsistent on top of that. If the topic is, say, the Australian film industry, Guardian pseuds will be simpering about the need to tell ‘our stories in our voices’ while blaming Hollywood for all manner of cultural imperialism. Yet there was the same pretentious rag fulminating about an Australian cartoonist going about his business in an Australian newspaper for an Australian audience. It is The Guardian‘s moral duty, apparently, to take offence on behalf of the residents of Harlem and Watts. And to be prize hypocrites too. Atop this post you’ll see Mark’s impression of a seething Serena. 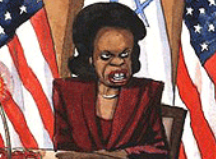 And below, a Guardian caricature of another well-known black woman, Condoleezza Rice. Much darker skin tone, same lips, same face of anger. Apparently, by the Guardian‘s bent yardstick, there are black women and then there are other black women. Zeg also has some thoughts on the Mark Knight affair. Follow this link or the one below for Zeg’s Take.